A weepy Cristiano Ronaldo was sent off in a Champions League away match for Juventus against Valencia in which Miralem Pjanic scored in both the first and second half. The Portuguese talisman was shown red after he appeared to grip Valencia defender Jeison Murillo’s hair after battling for a crossed ball just after 29 minutes into the first half of the match. The red came just when he (CR7) was on top of his game. Referee Felix Brych consulted his assistant behind the goal before making the decision to send off the new Juve 99 million pound summer signing. The five-time Champions League winner left the pitch in tears after furious and fruitless protests for not being guilty of the offence. This was the first time CR7 has been sent off in his UCL career (154 games) in which he has won 5 UCLs, with Manchester United and Real Madrid. Just before the half hour mark, Bosnian midfielder Miralem Pjanic scored from the penalty spot to make it one nil for the visiting side, and scored another spot-kick earlier on in the second half to make it two for the Italian champions. Valencia were just unlucky to have missed their penalty in stoppage time through Daniel Parejo which Juve goalkeeper Wojciech Szczesny saved to keep a clean sheet for his side. 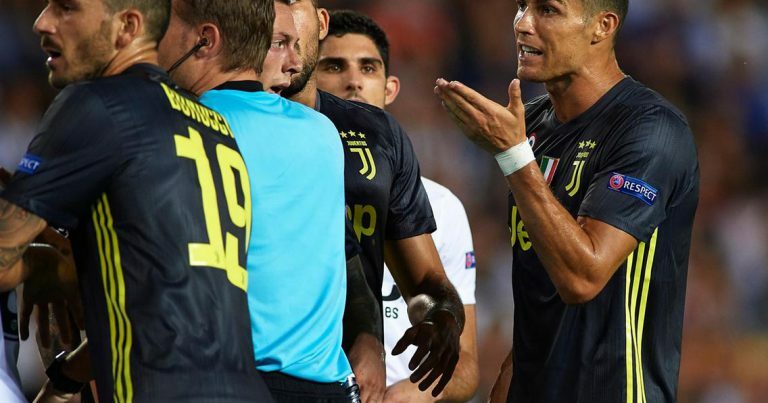 This was the 26th red card for Juventus, seven more than any other side in the elite cup, and as it stands it means CR7 will probably miss only one game against Young Boys on Tuesday, 2 October, 2018, only if UEFA decides not to increase the ban, since Ronaldo took so long to leave the pitch.